Menulog delivers for Cocorea Korean Restaurant so you'll be able to track your courier on a map. Japanese style chicken pieces cooked with special teriyaki sauce with rice. Japanese style pan-fried fish fillet in special teriyaki sauce, with coleslaw and rice. Twenty bite-sized boiled pork dumplings. Traditional Korean rice cake stir-fried in spicy chilli sauce. 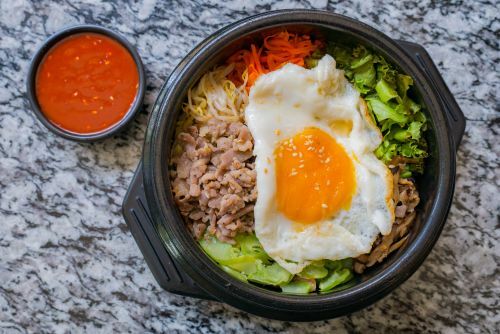 Traditional Korean bowl with various sauteed vegetables, rice and beef topped with an egg. Salmon sashimi and a mix of fresh vegetables on top of a bed of rice to be mixed with chilli sauce. Traditional Korean fried mung bean noodle and rice. Deep-fried pork cutlet with special Japanese sauce. Korean marinated beef with rice or noodle. Spicy Korean BBQ pork pan-fried with kimchi. Korean marinated pork with rice or noodle. Traditional Korean pan-fried pancake with kimchi. Traditional Korean pan-fried pancake with seafood ingredients. Smoked Japanese eel cooked in special teriyaki sauce served on a bed of rice. Korean marinated BBQ beef bento box. Cocorea-style fried chicken bento box. Fried chicken nugget bento box. Japanese udon noodle soup with a vegetable and prawn tempura. Traditional beef broth soup with a choice of either rice cakes, dumplings or both. Served with side dish. Traditional Korean beef soup. Served with rice and side dish. Traditional Korean spicy beef broth soup with a mix of vegetables and beef. Served with rice and side dish. Spicy Korean soft tofu seafood hot pot soup. Served with rice and side dish. Hot and sour kimchi soup based hot pot. Served with rice and side dish. Spicy hot pot soup with whole fish. Served with rice and side dish. Spicy hot pot soup with roe. Served with rice and side dish. Spicy hot pot soup with hard shelled crab. Served with rice and side dish.